Earnestness in music is often embarrassing, terminally uncool, and inherently absurd. How can anyone with a completely different set of morals, experiences, and hopes to a singer ever truly feel their moments of earnest expression? It’s easy to merely identify with earnestly sung words, but presenting heartfelt music leaves you open to mockery from those that mistrust the straightforward, and dismissal from those that balk at whatever statement is being made so sincerely. Biffy Clyro’s Simon Neil is emphatically unbothered about offending the anti-earnest on his band’s fifth album. 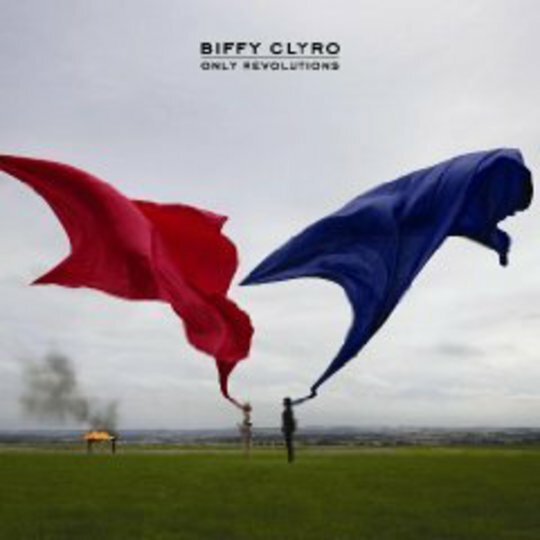 Only Revelations is a massive, bold and ambitious record, primed for radio but loaded with the unshakeable seriousness and belief that has run through Biffy’s career. A turn towards pop has alienated some fans of their earlier work, but almost everything here could be released as a single, and that’s an undeniably winning achievement. Anyone seeing Biffy tear through lead single ‘That Golden Rule’ live, with Neil screaming unintelligibly over superfuzzed guitars, would struggle to identify this new pop direction. Its verse is reminiscent of Biffy’s old guise as fierce, dextrous rockers, but an understated chorus wisely realises that ratcheting up to ‘very very intense and screamy’ from ‘very intense and screamy’ would not be wise. Neil is clearly now hearing orchestras on everything he writes, demonstrated by that song’s audacious string-led coda. These new overblown tendencies will not be to everyone’s taste. I saw a Sky Sports advert for the Chelsea vs Manchester United game last week and suddenly realised that the soundtrack wasn't from their normal stock selections of urgent strings, but in fact the aforementioned coda. That’s not a context in which Biffy’s long-term fans would ever have expected or wanted their cherished band. However the tightness of arrangement justifies the Big Sound dalliances, making them admirable rather than foolhardy, and a reminder of how far Biffy are pushing the power trio format. The idea-overload approach of complicated rockers like ‘There’s No Such Thing As A Jaggy Snake’ from Infinity Land has largely been abandoned, but there’s still a restless commitment to keeping things interesting which prevents the pop elements from becoming too sugar-sweet. 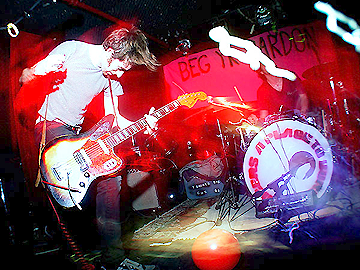 Steroid stomper ‘The Captain’ soars with flat-out silly horns and massive ‘woah-oh-ohs’ but there’s enough subtle edge and crunch to Neil’s guitar sound to counterbalance the layers of unashamedly catchy melody. Gifted drummer Ben Johnston is underused throughout, because there's not enough space in these monsters for him to deviate from relatively straightforward propulsion. No song lacks for a hook or a bright passage of tunefulness. The mood of unprepossessing arena ambition reminds me a little of Eighties ‘set the guitars to ‘bagpipe!’’ specialists and fellow Scots Big Country. While the intensity of Biffy’s louder songs elevate them from well-written to fist-pumping, the earnest tone is harder to take on the more exposed quieter numbers. The godawful juvenile lyric to ‘God And Satan’ (sample: “I know for certain that someone is watching but / is it from up or down?”) is going to be scribbled in full on a hundred exercise books by very serious teenagers this winter, but it doesn’t really wash when you remember that the author is in his 30s. Another misstep is so-so ballad 'Many Of Horror' which proves conclusively that if your vocal sounds like the gasping tearful apex of a breakup argument then you’ve definitely slipped into 'too emo' land. Now write it down slowly and read it out fast. It’s easy to give Neill a pass on his frequently cringeworthy lyrics because of the conviction with which they’re sung and the frighteningly catchy melodies they’re carried on. "I am a mountain / I am the sea / you can't take that away from me"; again, these are awful, awful words written down but when they’re sold with such gumption and belief on record belting them out in sympathy is irresistible. Although there are storms of genuine heavy rock (‘Cloud Of Stink’) and grown-up mid-paced diversions (‘Bubbles’) on Only Revelations there's an alluring chirpiness throughout. The guitar lines sound like a stranger’s extended hand after you've fallen to the floor; the overall mood is like talking to a comforting friend when you’re miserable and confused, possibly about the correct pronunciation of ‘aluminium’. It’s puberty pop, reminding what will surely be its core listener base that despite the horror of hormones, things are pretty great. Framed as a poppy entry point to intelligent guitar music it's hard to imagine a more welcoming or better-executed record. Grandeur suits Biffy Clyro, and their overblown songs manage to tug effectively on heartstrings despite their foibles. Their vibrant brand of ridiculousness is infinitely preferable to the mass emotional prescriptions of Snow Patrol or vapid truisms of Coldplay. It’s more interesting to get a crowd yelling something silly and possibly meaningless back at you than having thousands of people agree that yes, it is a beautiful day. I hope that their star continues to rise and they grow into the stadiums that these songs reach for.